Our tough and stylish canvas tool bags make carrying tools and accessories super convenient! The heavy duty zipper keeps the bag securely closed while traveling, the open-top design and makes it easy to locate items when open. 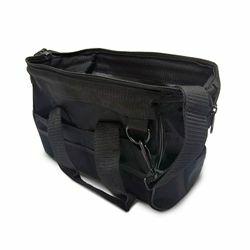 Multiple pockets on the outside of the bag allow for a lot of organized storage. Pros: Well made. Studry. Shoulder strap has plenty of adjustment to it. Cons: Outer pockets are a bit small. I can fit a couple TIA/EIA 568 jacks in them, but not much else. If they were larger with a heavy duty elastic closure they would work well. Other Thoughts: I use this for a lineman's test set, punch down tool, tone and trace set, telephone type 6P6C/8P8C crimper, basic line tester, jacks and heads. I don't like having these tools mixed in with my others because I do not need them all the time. This bag is just the right size for my small data and telephony line maintenance kit. 13 out of 20 find this review helpful. Pros: Durable, tough, nice construction, small compact size at a good price. Cons: Exterior "pockets" are essentially worthless. Other Thoughts: I use this bag to hold a basic tool and diagnostic kit for workstation and server administration and maintenance. I take it everywhere with me and overall, it works great. The only thing I dislike is that the exterior pockets are so tight to the side of the bag, they basically can't be used (or if you did, you would worry things would pop out). But for the money, you can't beat it. It's a dandy little bag. 8 out of 14 find this review helpful.